Laughs and our first ever GIVEAWAY! It was a pretty chilly day to be climbing in Kentucky; maybe about 8 degrees. The sun had yet to hit the wall of the crag we were at and the rock was so cold your hands would ache on climbs. We met a small group of young climbers from various parts of the States and we became fast crag friends– chatting, offering beta, and cheering each other on. At one point a girl who was part of the States crew disappeared for a pee and returned a few minutes later from around the corner of the wall holding her chalk bag straight out in front of her. It looked like she was offering it to us. She was breaking a smile and her expression said something strangely proud like, “So guess what I just effing did! ?” Likely, in the haste to pull down her pants and harness to prevent her lady parts from catching a chill, her chalk bag must have dangled its way under the stream and… she pissed right in it! She was simultaneously embarrassed and gratified with this feat and we were all totally awe-struck with the precision of this accident. We laughed, maybe applauded, and for the rest of the day no send on the wall even compared to this accomplishment. To this day I think about her when I’m making potty in the bush. You should too: ensure that your bag is out of harm’s way so that your essential chalk does not end up turning into pee-dough. Life lesson folks, life lesson. So, what’s the funniest or most bonehead thing you’ve seen at the gym or crag? 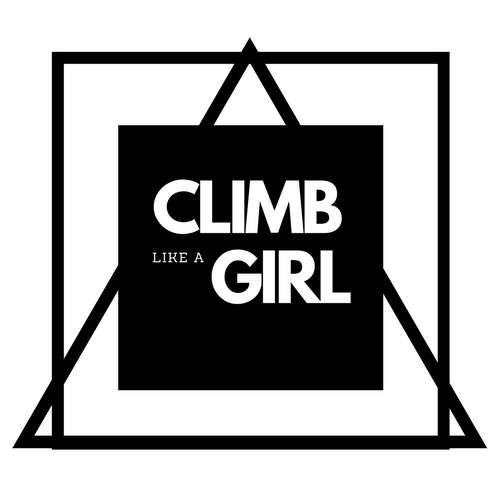 3) share your story and picture via Instagram with the hashtag #climblikeagirlgiveaway. Must be a resident of Canada or the United States. The winner will be chosen at random, and contacted at contest’s end June 13, 2016. No restrictions on story lengths. Our giveaway prizes. Just in case you forget the lesson learned above and need a new chalk bag! We are adding in some Flashed liquid chalk and Metolius super chalk (not pictured). So we told a fellow climber about a climbing spot we all know as the Jordan harbour train bridge. The guy goes down there to check out the sweet bolted climbs. At the time this climber has grown out a really long beard and hair. When the guy gets to the base of be bridge, Niagara police tackles him, arrests him and calls him a terrorist. Turns out the bridge was under investigation for terrorists planning bombing attacks there. My horrifyingly embarrassing climbing story. As a precursor, I should mention that I’m terrified of falling. Absolutely petrified. It sometimes boggles my mind how I got into rock climbing, but fear or no fear, I love it.So, on this day I was waiting for my friends to show up for top roping. They are my belay partners, and they were running quite late.I decided to boulder till they got there. There was a problem I’d been working on with the guys the last time we’d been climbing, and since I was there, and because I really didn’t expect to get very far, I decided to work on that one. Shockingly…I did it. I just felt it, went with it, and holy crap I was suddenly at the top of the wall. Success ! Only…oh god. How do I get down ? I looked down, and the ground was about a bazillion miles away (I refer you to aforementioned fear of falling). I was definitely sure that falling meant risking serious bodily harm, so I attempted to downclimb. Only, oh god ! There were no good holds nearby ! So…I was stuck. I must have chilled there for a minute, though it felt like an eternity, when I heard a kid’s voice go ‘just go up ! you’re almost there!’. The kids class had shown up. Oh god. Oh godohgodohgod. ‘Uh no, that’s fine. I finished the climb. I need to get down’ . I then proceeded to stay glued to the wall. My hands stubbornly refusing to let go. The kids stuck around and cheered me on, waiting for me to let go. I continued to stay stuck on the wall. I idly wondered if I could actually hang on a full half hour before my friends showed up and if I could get the guys to come carry me off the wall. I started counting mississippis. The kids gradually wandered off, and still I stayed. I wish I could say this story had some kind of redeeming ending, but it’s not that kind of story. After a gruelling 10 mins, my arms finally gave out and I fell. I was fine. Nothing bruised but my ego.